Great Plains Millwork has been supplying premium building products and top-notch service to residential and commercial builders, remodelers, contractors, and interior designers in the greater Twin Cities metro area and Western Wisconsin since 1991. Specializing in doors, windows, and millwork ranging from traditional to high-end trim, baseboards and crown molding to banister spindles and rails, we are sure to meet the needs of upper-end custom home builders and home remodelers. Our history is dotted with amazing new home projects throughout the Twin Cities metro area. We’ve worked to create the premier finishing materials for some of the most impressive new home projects throughout the last 25 years. 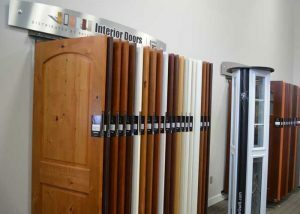 Our showroom in Oakdale has a wide offering of stair parts, window and door hardware, entry doors, interior doors, millwork and mouldings, and Andersen Windows. Our steeped relationships with vendors have allowed us to simplify the process for builders and homeowners looking to make selections for their projects. We want to be part of the process for you because we know what’s possible and the right way to approach a successful interior trim package and window and door order. 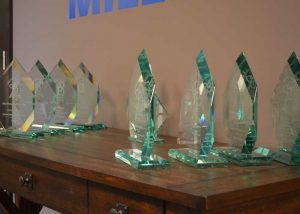 Great Plains Millwork was founded on the principle of Service, Service, Service. We intend to exceed expectations at every step of the project. Our service doesn’t end at delivery though, we are here to support our partners with replacement parts and service down the road. We are the preferred Andersen Windows Service Provider in the Twin Cities area. We also can support any of our other products with our relationships with manufacturers. In addition to our builder and remodeler supply division, we also have a complete in-house replacement window division called Great Plains Windows. As a direct replacement window installer for Andersen Windows, we now offer a turnkey service to homeowners looking for quality replacement windows with the full-line of Andersen window options. We have an extensively stocked inventory warehouse that is sure to supply the home builder with beautiful products that will exceed expectations. The “wood” shop at the Great Plains Millwork head-quarters in Oakdale is so clean and well organized that you could eat off of the floor and be no worse for it. Open and light-filled, the 30,000-square-foot space sports remarkably high ceilings and, in spite of the humming activity, this visitor found the expansive space peaceful and cool on a very hot, early September day. Maybe it was the soft scent of wood permeating the air that made it seem private, like an urban sanctuary. President Jim Clark explains that Great Plains specializes in doors, windows and millwork of every kind ranging from baseboards and crown molding to banister spindles and rails. In business since 1991, its client base includes upper-end custom home builders, independent contractors, interior designers and, occasionally, custom architects, all of whom require top-notch service. Clark lists such loyalists as Charles Cudd, LeGran Homes, Steiner & Koppelman, DeWitt Homes, Derrick Construction and Kootenia Homes as business mainstays. Recent additions to their client list include Hagsrom Builders Inc. and Husnik Homes. To satisfy these customers, the shop is filled with rows of framed doors, windows ready for exacting extensions and long lengths of milled wood in many different profiles. In addition to oak, maple and birch, the client can choose from cherry, walnut, cypress, and the current rage, knotty alder, to name only a few species. Also on hand is plenty of paint-grade poplar for those seeking the clean, crisp look of enameled wood. When the visitor remarks on the breadth and depth of product on site, Clark responds matter-of-factly, “We always have at least a million dollars in inventory. No doubt, we are well stocked; you can’t sell from an empty wagon, you know.” No empty wagon here. However, Clark clarifies that Great Plains doesn’t only fill large orders. Many client requests are special orders for custom, high-end jobs. “We get lots of special requests, one-of-a-kind orders from individual clients,” explains Clark. “It is not unusual to have an order for a $25,000 exterior door system … or to have an order for a very unique balustrade in a high-end home. People want their front entry to be just right.” Clark explains that for more than 10 years, the doors and moldings have arrived pre-milled. “Great Plains can purchase pre-milled product cheaper and the quality is just as good as when the company did its own milling,” explains Clark. 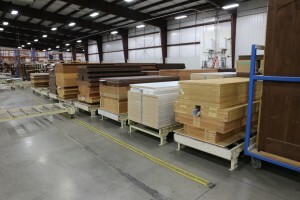 The company purchases a majority of its doors and trim from Woodland Supply Company in Winnipeg, Canada, and Brainerd Hardwoods in Brainerd, MN. Typically, Great Plains’ doors are delivered pre-hung which ensures a more efficient installation process. For its windows trade, it is a dealer for Andersen Windows.